This is an assortment of Czech glass beads in eight different shapes that I no longer use. Most of them are leaf and flower shapes. One of the sections is filled with tiny glass cubes. 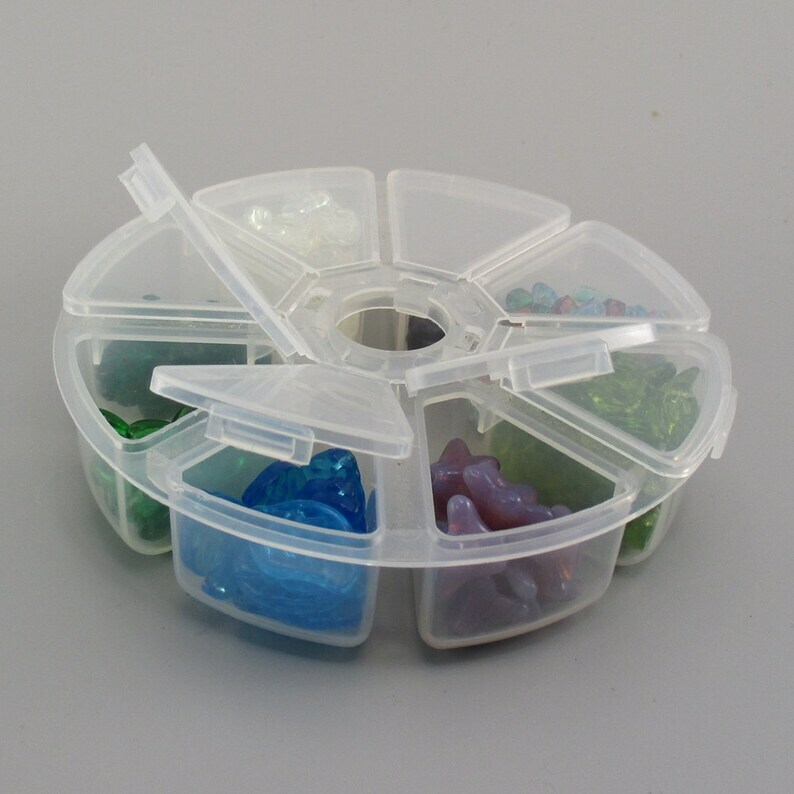 The storage container is plastic, 4 inches by 4 inches round, and is divided into eight small sections. All the beads that you will receive are pictured. These are the exact beads that are in the storage case.
? - Love it and want to buy later? Click the button to your right that says "Favorite"
Full payment is made upon checkout. Custom orders require a 50% non-refundable supplies deposit. I want you to love your new purchase! If you are anything less than thrilled when you receive your order, please let me know and we will work together to resolve any issues to your complete satisfaction. If you should decide to return your purchase, you may request an exchange, refund, or shop credit for the merchandise cost. Please contact me within 15 days of order delivery. Your choice will be quickly processed upon receipt of the returned item/s, in their original condition with all original packaging. Buyer pays return shipping. Exception: Destash items cannot be returned for refund, exchange, or credit. These items are clearly marked as destash in their listings and appear in their own shop section. See the FAQ's below for more information. Handcrafted jewelry, accessories, and home decor items are shipped FREE, via USPS first-class mail with delivery confirmation, to anywhere in the 50 United States. Supplies and "destash" are charged shipping as indicated in their listings, since I offer those items artist-to-artist at such low cost. They are shipped via USPS first-class mail with delivery confirmation. If you would like me to use a different shipping method or rush shipping for your order, please contact me before you make your purchase and I will find out the additional cost. Promotions: Only one promo or coupon code may be used per order. Per CPSIA guidelines, products in my shop are not recommended or certified for children under 13 years of age. They are made of very tiny glass beads, often as small as 1mm. My computer is color-calibrated and I have made every effort to show all items as true to their color as possible. Depending upon your monitor and lighting conditions while you are viewing, some colors may not be shown on your monitor exactly as they appear. Thank you for spending the time to read my shop policies. If you have questions, comments, or just want to say hi, please message me. This can be easily done using the "Contact" link near the top of this page. I love hearing from you! What are destash items and why can't they be returned? Destash items are goods that were in my own supply inventory and that I am not presently using. They are not damaged or inferior in any way. Some examples might be: duplicate copies of books/magazines; storage containers; beads/findings that I bought but never used; an open package that Is partially used; etc. My destash section is a great place to hunt for bargains! Because they are my own supplies that I am passing on to other artists at a discounted price, I am unable to accept returns on these items.